Printworks offers a wide variety of outstanding photo paper for all of your photo printing needs. 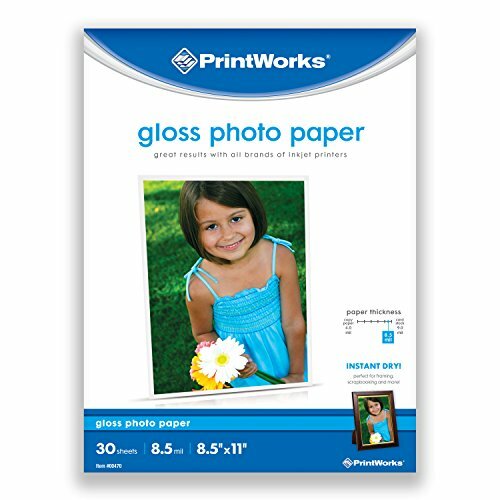 Printworks Gloss Photo Paper is a heavyweight, 8.5 mil paper, with a smooth, gloss finish that is perfect for artistic-looking prints in a frame or as everyday prints in an album. Its instant dry coating ensures that your important photos will print and dry quickly without the risk of smudges or smears. Photos print with sharp detail and vibrant color because of the built-in Tru ColorTechnology. Take any print project from ordinary to extraordinary with your inkjet printer and Printworks Gloss Photo Paper. For over 50 years, we have been the experts on coatings, paper finishes and the total printing process. The Printworks family of specialty inkjet papers let you create unforgettable photos, attention-getting business cards, "A+" grade school documents, and creative craft projects. Each one demands the thought, the creativity and the paper to make it stand out. Printworks brand photo paper, transfers, cards, and labels are designed and engineered with you in mind. Stringently specified. Meticulously crafted. Assured quality. Satisfyingly affordable. All come with a 100% Satisfaction Guarantee. If you have any questions about this product by Printworks, contact us by completing and submitting the form below. If you are looking for a specif part number, please include it with your message.